I’m usually a little out of sorts when I leave the prison. My head and my heart both seem to be going in crazy directions. When one has a family member tucked away from the world, aspects of life can seen hopeless, helpless and senseless. Last week’s visit was no different. On the two-hour drive there, I noticed I’d need gas in my car at some point before heading home..
“I’ll get it at the station just outside the prison’s entrance,” I thought to myself. There’s not a lot around the prison, but the gas prices at this little country store are typically about 10 cents less than the station in town. Silence… that’s what my son and I shared as we exited the doors and walked toward the car. It’s awkward to feel like you have had a “good” visit with someone when you do your visiting with concrete and glass separating you and your loved one. But it was a good visit. It was better than many we’ve had to have, and we both knew it as we walked across the parking lot. My words were chit-chat, but my heart and my head were a mess. “I’ll let you drive in a little while when we get on the straight stretches on the other side of town, and I need to get gas at that little station just down the road,” I told my son. It’s all I could really say. I exited the prison’s driveway, drove down the road and pulled into the gas station at the country store. As I got out of my car to walk around to the pump, an old ’70s Chevy pickup pulled in right behind me. A gray-bearded man in a John Deere ball cap motioned for me to come over to his truck. “It’s a Bible verse, Sir. It’s a verse that means a lot to me. It’s Romans 8:28,” I said to him. “Is that what it says?” he slowly pressed with more curiosity. “Not with those exact words, Sir, but that is a sense of what it means,” I shared with him. He smiled at me, gave me a wave and pulled his rusty ol’ pickup truck into a parking spot. I moved toward the pump to insert my credit card to pre-pay for the gas, but I saw him get out of his truck, look my way and give me a glance under the brim of his cap. “What did that guy want?” my son asked from the passenger’s window while I put the nozzle into the tank. “He wanted to know what my license plate means,” I told him. When I got back into the car, my son just looked at me with an “are you serious?” kind of face. We’re in a phase — and at a point in his life — where faith-based decisions and choices keep coming up. He’s struggling just a bit to submit to them with a cheerful heart, and he rolls his eyes at me quite often when I look at him and want to launch into one of my “there’s a lesson in that…” discussions. Was I there to answer an old man’s question and give him some hope? Or was that old man there to ask me a question which would remind me of His hope? Was I put there in that moment? Or was the old man put there? Or were both of us put there for different reasons and for different conclusions over the same conversation? Was I in the right place at the right time to show my son how faith boldly intersects in every aspect of our lives? Or was he in that passenger’s seat in that moment to witness how, in fact, it does? Was I there in that moment to get my thoughts away from my broken heart? Was I there in that moment to hear my own words and to really HEAR His words in the process? Was he an old man in a truck, or was he someone else? We can never know how all of the incidences in our lives are woven together, but Romans 8:28 serves as a regular reminder to me for the things I do see and do experience. Life has been a challenge over the last four years, but through it all, my hope is only growing in His ability to work ALL of it for good — my good, my son’s good, my family’s good, the good of others — and ALL of it for His glory. I do struggle in the moments and in the circumstances, but the precious chances where I find myself outside of the moments and circumstances and in the midst of how Romans 8:28 is being made reality are true blessings. Dear gray-bearded man in the old, red Chevy… thank you for stopping to ask me about my license plate. I didn’t just tell you about Romans 8:28 in that moment, I experienced the beauty, the possibilities, and the reality of one of many ways it is being fulfilled. I found HOPE in your question. Hi Donna, it’s Terry Gocke. 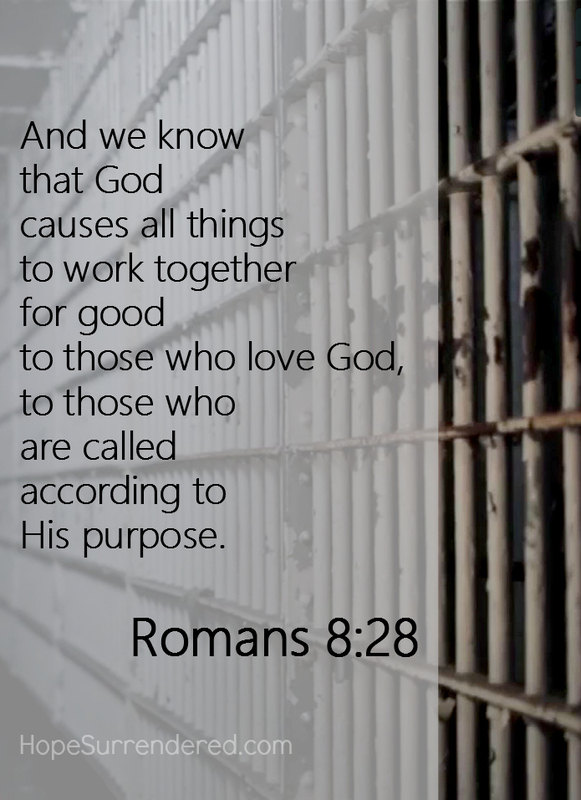 I read your comments concerning Romans 8:28. I really empathized with your feelings and thoughts. Thank you for sharing with us. Thank you, Terry. I sometimes struggle to share some of the details of my life, but I’ve come to realize that some of those details are what help to bring hope to others and healing and hope to me, too! This was beautiful. Tearfully reminded of how precious our encounters are with Him. He is the Author and finisher of our faith. Whether that man was there for you, you for him, or it was Him, we don’t know. We do know it was about Him and His precious daughter and her son. The fact that you shared it with us is a wonderful gift. Oh, my… they ARE so precious! His presence overwhelms us, but I just think we miss it so often, or we pass it off as something else. I really don’t know who that man was… when I first drove away from the station, I just thought he was a curious old man who kindly accepted my explanation. He’s been staying on my mind though, and I’m just not really sure. I know that coincidences are really God-incidences, so no matter who he was or Who He was in that moment, I just feel blessed to have experienced that brief moment. The brevity of it in the moment has been outlasted by my prayer-filled heart about what it all could have really meant on a deeper level. And, no matter what, I know that the moment has changed a piece of my heart and given me even more perspective on Romans 8:28. I’ve been learning from others willing to share pieces of their own story with me, that when I’m also willing to share my own story, healing, connections, relationships and growth happens on so many levels. I’m truly grateful for the intersections… the crossroads… which happen in our lives when we choose to allow others to do life with us and when we’re willing to do it with them, Kelley. Enter your email address to follow my journey & be notified by email about new posts.